Some Edina, Minnesota students in grades K through 12 are lucky to have our newest hero as their teacher. Kristie Mahar-Ortiz teaches students suffering from mental illness in a partial hospital program at the Richfield West Campus at Prairie Care in Edina. To help them cope with their daily difficulties, Kristie offers them a chance to make pillows by hand. The students, who suffer from varying degrees of mental illness, love both the sewing of the pillows and the end product. Both boys and girls alike choose a design and then hand sew the pillows during breaks from their school time. The families and other contacts in the kids’ lives also benefit through improved mood and a positive personal outlook the kids acquire in the process. Kristie calls herself a Mother, Wife, Daughter, Sister, Sister-in-Law, Aunt, Teacher, Friend. Thank-you so much for all you’ve done for our daughter. She has made such strides in school this year. She has confidence with her self-control and has learned how to cope with her aggression in a more positive way. She insisted on taking her coping pillow to school with her. Her teacher allows her to keep it in her cubby so that if she needs a break, she can take it to a focus area and self-calm. The pillow is her safety net. She tells how she picked out the fabric and sewed it, “It only took 4 days and I got to take it home forever!” Who knew such a simple project would make such a difference in her life as well as ours. Thank-you again for giving us back our little girl." "We are up to 25 pillows already this year! 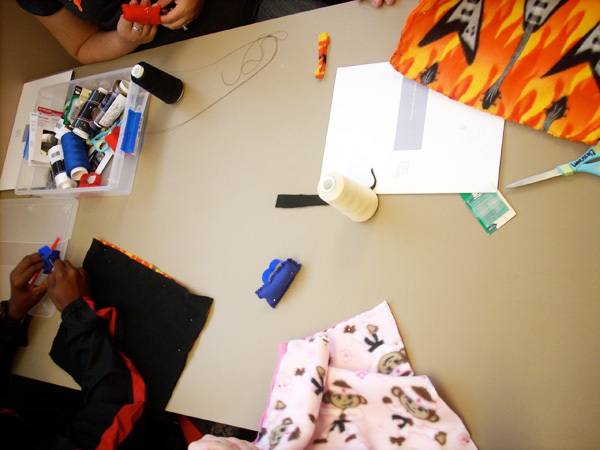 This photo is a 2nd grade girl, first sewing experience. We have gained a second teacher in our program and a para-professional. 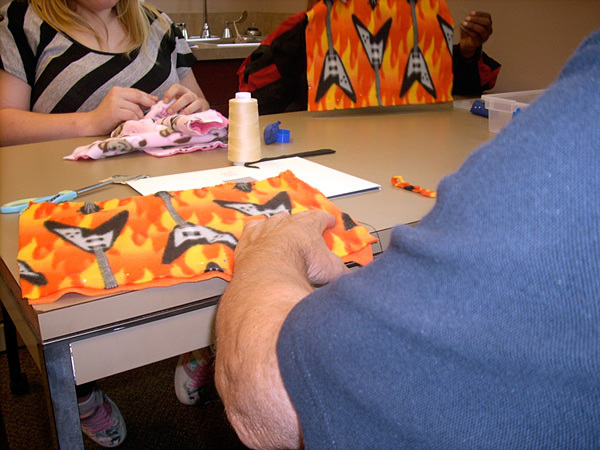 They are having a blast making these pillows with our students. You should see how they toil over the selection of fabric and then wanting their stitches to be the best. It is wonderful. You have done more for these kids than you will ever know." "Oh, what a fun week we've had. 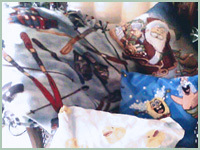 The kids were major excited to see the fabrics and start their pillow. They all got busy sewing, the room fell silent as the kids concentrated on their stitches. 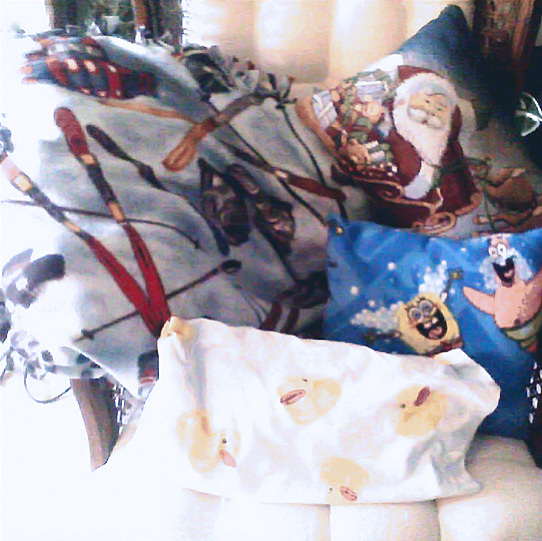 Then they started to do the stuffing and close the pillows. They were so proud, carried them around like gold. Again, our whole staff thanks you for your generous help in providing us with the materials from JoAnn Fabrics. What a blessing!" "These pillows are from last year but it is an idea of what we do. I am so excited to show the students all the patterns of fabric they will get to choose for their pillows. Again, I can't thank you enough for allowing me to extend this wonderful learning opportunity to my kids. I wish I could send you a video of them working on the pillows, but as they are patients in a mental health hospital I am not allowed. It is fun to see them compare the expertise of their stitches and how nicely they've hidden the seal point of the pillow. They really don't mind taking out stitches if it means doing it better, in how many other subjects could you say that was true? School starts September 8th this year." 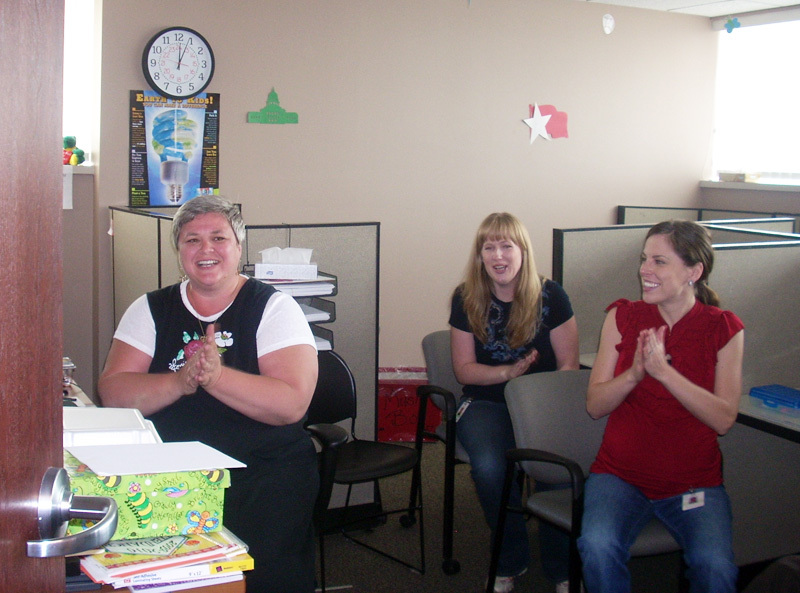 Kristie emailed that she and the staff were thrilled about her grant and how much it would mean to the kids. That must be true because she has already placed her order for the pillow supplies from Joann Fabrics. I surprised Kristie today with a phone call at work while about a dozen staff members gathered around to share in the good news. It was kind of funny because they all applauded when I said my name before I even said why I was calling. But they all knew and now Kristie knows that she can go shopping for her pillow supplies. She shops at Joann Fabrics just like I do. 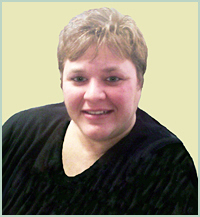 She is the only teacher who works with the medical staff at PrairieCare and has been there for four years. She said they make about a hundred pillows a year and I asked if she would send us some photos of them. Kristie is married and has a 6-year old son. 06/12/09: Jenny wrote... "Kristie, as a seamstress myself I know how relaxing it can be to sew. I can see how this would be very beneficial to your students." 06/12/09: Damon wrote... "Hi Kristie, Congratulations on receiving your grant. It's such a great thing that you're doing for your students." 06/23/09: Anthony wrote... "Hello Kristie! I think it is awesome how you seem to be so peaceful with the challenges that face you every day at PrairieCare. Congrats on reaching out to not only keep your peace but to bring peace for the children who face very hard challenges every day." 07/03/09: Carol Dellinger wrote... "Kristie is a hero. She has been ever since I've known her. 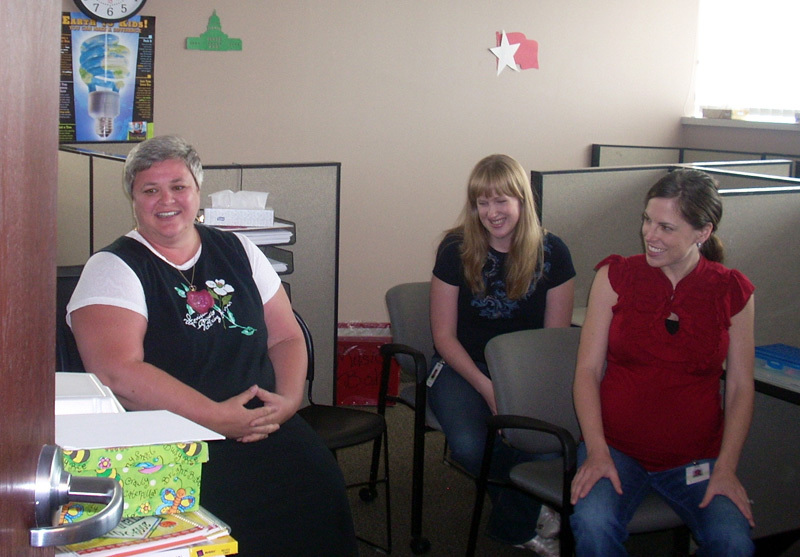 Her first teaching job was in a small reservation town in North Dakota. She had many children with specials needs and Kristie would sometimes say that she went shopping because some child didn't have shoes or clean socks. I admire this quality in Kristie. I know her students are her family and I can only imagine the laughter and joy she must bring to them each day. I am so happy that she received this grant to help with the purchasing of supplies, which will benefit the children. It's all about the children with Kristie. Kristie is an awesome teacher and my dearest friend. Love you Kristie. 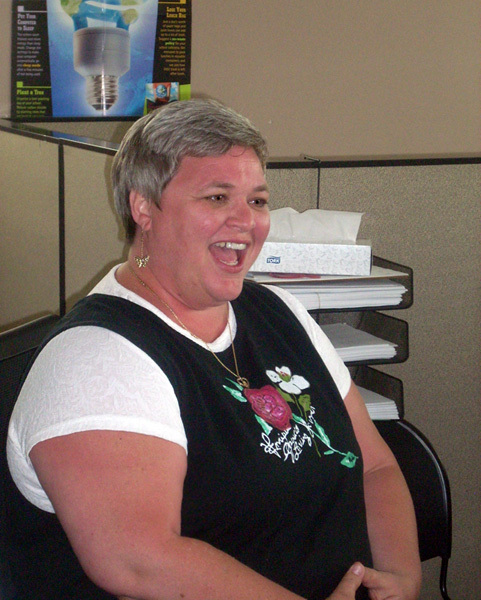 Love, Carol Dellinger"
08/08/09: Marianne wrote... "Kristie, you certainly are special. I have witnessed young challenged people working together to assemble items at a work station. As anyone would, they took great pride in their accomplishments, and were so meticulous and happy working together to achieve a goal. It great of you to be able to provide that sense of self-worth. Good for you and them."